​In the beautiful setting on the banks of the Hudson River. 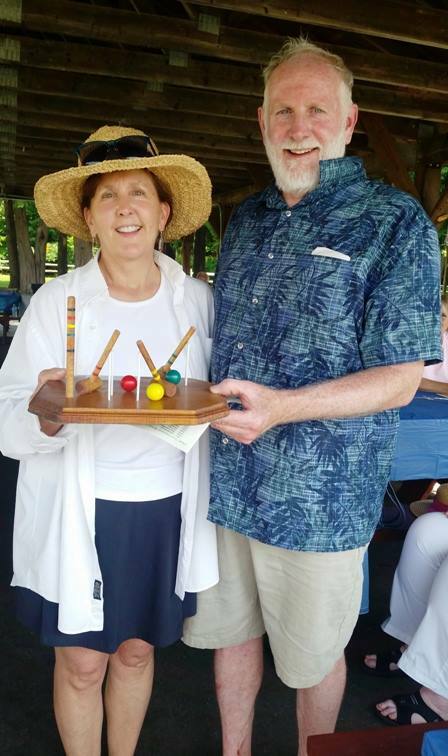 The Sticky Wicket Croquet Games & Picnic was developed in 1997 as Warrensburgh Historical Society's primary event, bringing together members and businesses of the community for a fun event with a historical perspective, as well as a fundraiser. Thanks to the generosity of Warrensburg’s businesses and community organizations, and “potluck” offerings by members, the Society offers a free picnic that is open to the public. Both young and old enjoy an old-fashioned affair with great food and genteel competition. 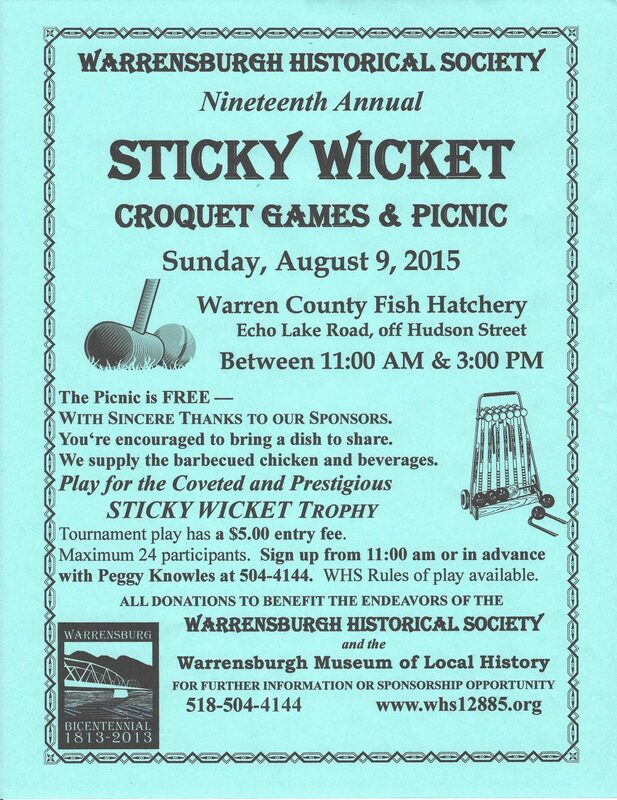 The Sticky Wicket is held annually in August. The origin of Croquet may have been in Brittany and Southern France where, in about the fourteenth century, a game called Paille Maille was played. A game called Crooky, a bit more like our modern version of Croquet, was played in Ireland in the early 1800s. There is a valid argument that the game did indeed have its origins in Ireland, but no one knows for sure, and most do believe it to have begun in France. The game was introduced to England in the 1850s. The hoops were made of bent willow rods and the mallets of a hard, knotty piece of wood, bored to accept a broomstick for a handle. By 1865, Croquet had achieved wide acceptance and had spread throughout the England and its colonies and was introduced to the United States in the early 1870s. The game was first taken up by high society and, by late century, a croquet set seemed mandatory equipment for every estate. 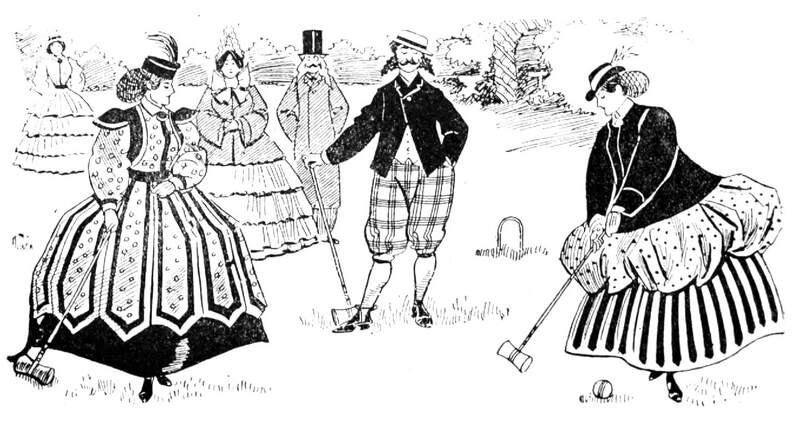 Croquet was among the first games to be played by both sexes, and to this day, it is the only sport in which men and women compete with a similar handicap. At the turn of the century, the game had become so commonplace that a Boston preacher“banned the immoral practice of croquet", as it had become associated with gambling, drinking and philandering. After the First World War, American Croquet became such a fashionable pastime that it was often played in one's backyard in whatever space and layout that was available. Even children played! As always, many affluent and popular people have held the game in almost maniacal esteem. There now exists not just one way to play the game, and variations of the court size are allowed. The equipment and the general concept of the game have remained basically the same. We have developed our play based on American Lawn Croquet rules, but somewhat less structured to allow for a more relaxed and fun atmosphere, and yet retain the competitiveness of the sport. May you not encounter a STICKY WICKET!